Treat your skin with these gorgeous handmade soaps. Created by Emma Larkman after her eldest daughter suffered from skin complaints such as eczema, they are full of naturally-occurring ingredients that are suitable for sensitive skins. 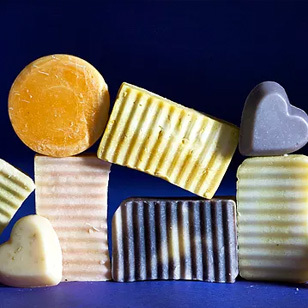 Emma chooses to make her soaps using skin-friendly goats’ milk, essential oils and natural colourants and steers clear of palm oil and artificial ingredients. Once you’ve tried natural soap, you’ll not want to go back to the harsh, commercial varieties! Escento soaps produce a luxurious lather and are typically rich in skin-softening glycerine, anti-oxidants and nutrients that are beneficial to skin. The delicious flavours (such as sweet chocolate orange, honey and oatmeal, rose geranium) are almost good enough to eat and every bar is hand-cut and packaged in recycled material.